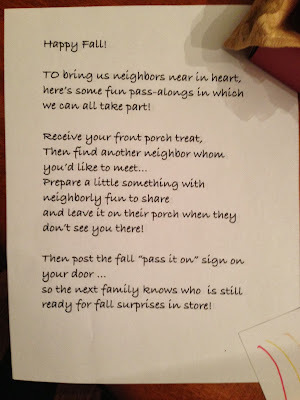 I bring you another Pinterest success story just in time for fall decorating, and if you do it right, you can swap many of the elements out for a Christmas version (more to come on that one). 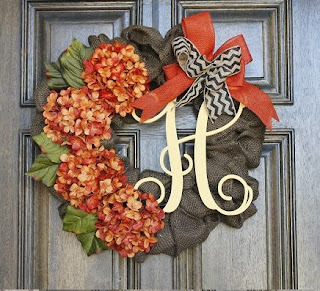 I was able to get all of the materials at my local Hobby Lobby, which made it easy to shop and assemble the wreath all in one weekend. 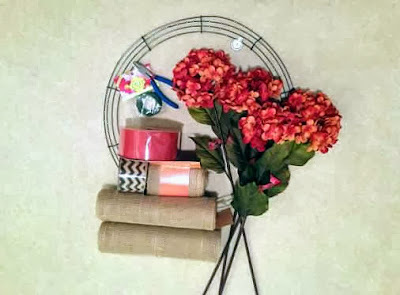 Total cost of the materials ran about $50; if you make one with a friend, you could easily save $10-15 by using coupons and sharing the decorative ribbon. 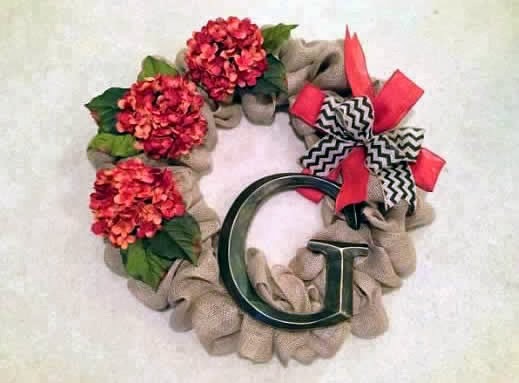 If I had been focused, I think I could have completed my wreath in two hours, but Surviorman was on TV that night and I kept getting distracted by how he was able to keep a fire burning through a thunderstorm. You know how it is. Attach the burlap ribbon to the cross piece of the wire wreath frame. I found that "basting" the ribbon with a piece of the floral wire (about 4 inches long) then wrapping the wire around the wreath frame with a few twists secured the ribbon easily. 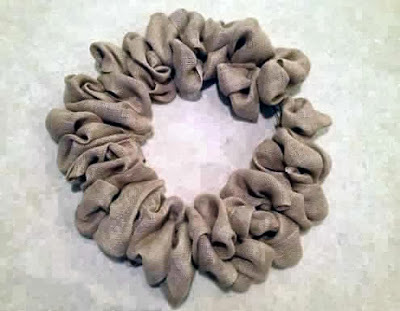 Create a loop and attach the burlap to the next wire in on the wreath frame. A couple of things to note: This is not a science, and your loops don't have to be perfect. 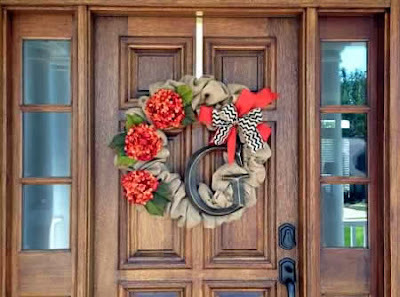 Just work your way up and down the wreath frame, shoving the loops together and adding more. 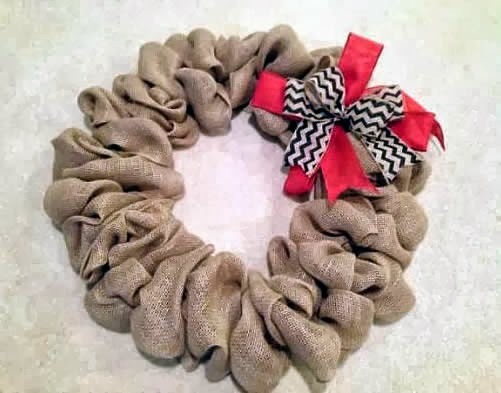 It takes a while to work around the wreath, but you'll use both rolls of burlap. When you've made it all the way around with the burlap it will look something like this. Notice the "bare" spot in the top right (2 o'clock) where you'll attach the bow. 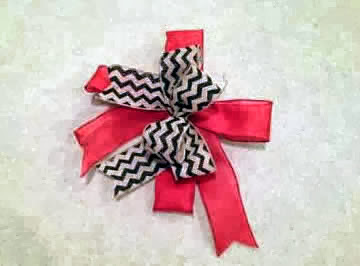 Time to make the bows. 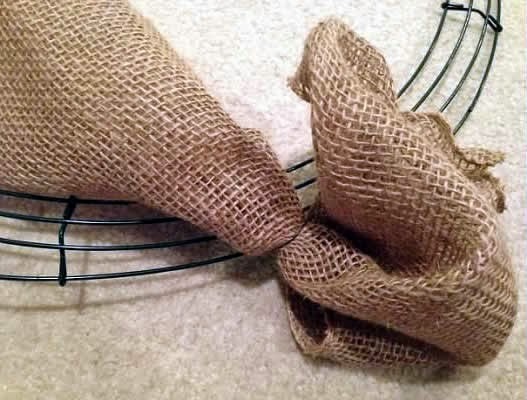 Make four loops out of your solid burlap ribbon and tie them together with floral wire that is 7-8 inches long (don't cut off the excess wire). 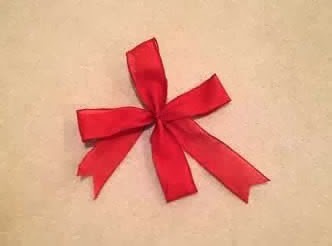 Make another four-loop bow slightly smaller than the solid bow. 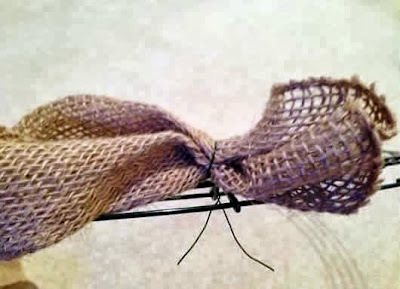 Use the wire on the solid bow to create the knot. Use the floral wire to attach the stacked accent bow to the wreath base, and then adjust it until you like how it appears. You may also need to adjust the burlap below it so that the ribbon lays properly. Use your wire cutters to remove the leaves from the floral stems. Cut the blossoms off the floral stems, leaving just 1 inch of stem on the blossom. This is enough to secure to the burlap with hot glue. Keep the wire cutters out. Flip the wreath over and wind the wire ends from the burlap back up into the wreath. Trim the ends were necessary. 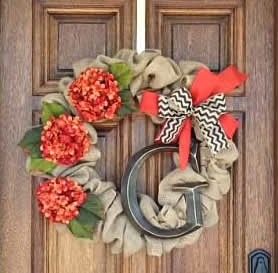 They key here is to make sure you can run your hand along the back of the wreath without being scratched. Adjust any rough spots so you don't damage your door. 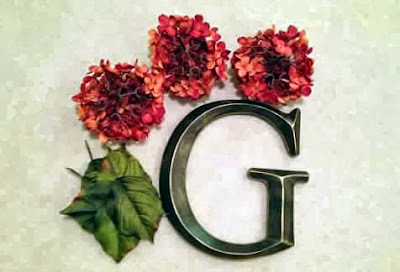 Attach the flowers with minimal hot glue if you want to be able to swap out the colors with the seasons. Wire the letter to the wreath. I also added a few hot glue dots here and there because I didn't want the letter to shift. My floral wire was green, so i hit it with a Sharpie marker and a decorative gold marker to mimic the detail on the letter. You can't tell unless you're up close to the letter, which is fine -- it's a wreath, people! I'm so happy to be able to share these photos of the finished king-size Lone Star quilt that I've been working on for a large part of this year. I created the top, backing, and binding for my college friend Marcy, and then I sent it to her to arrange longarm quilting and finishing. The star panel was a little over 1/3 of the desired width for the quilt - 105 inches - so I added two red panels to fill out the rest of the width. I squared it up as best as I could along the way (king-size is huge! 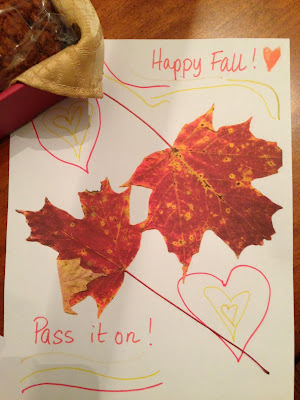 ), and packed everything up to mail to Marcy. 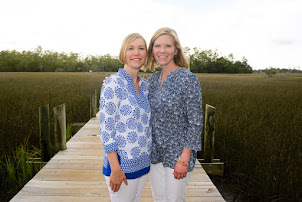 She met with the longarm quilters at A Better Quilt (http://abetterquilt.com/) to select a quilting design, and they had it done for her in a week - impressive! 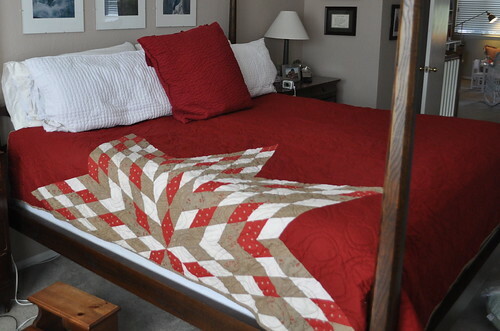 The large swirly design softens the sharp lines of a quilt this size, and I think it turned out so great. 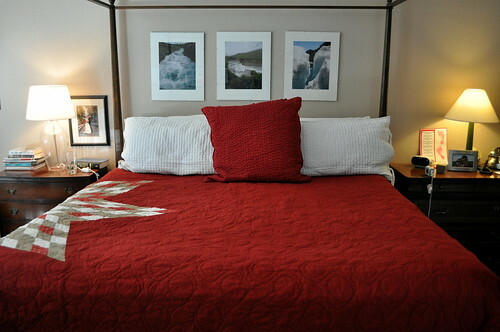 I'm pleased that Marcy and her family are so happy with the quilt, and I hope they enjoy it for many years. 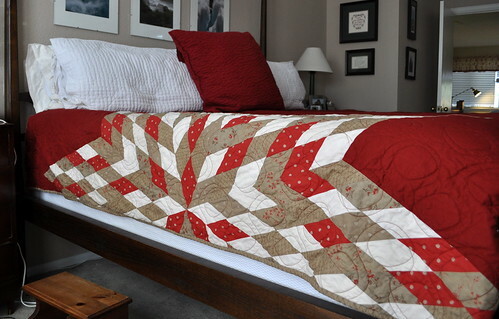 I wouldn't say that a king-size Lone Star quilt was on my quilting bucket list, but now I can put it on and check it right off. Done!